This is classic YA at its best. To me, classic YA follows a formula: an older teenager, usually a female, has tragedy strike the family, usually a death of a close family member. Best friends turn out not to be best friends, and good-hearted oddballs become the new, reliable best friend. The stories are full of pathos. The drama is high drama. Everything is tragic at its utmost. The romances are true love. And the adults don’t really ‘get’ any of what the teenager is going through. The Huaca has all of this, and more. Marcia Mickelson manages to meet all the YA expectations, but mixes in some mystery and fantasy as well. From the opening sentence (“The snow makes everything clean again.”)to the hopeful ending, Mickelson grabs my attention and piques my interest on every page. I did not want to put this book down. The story: Ellie Cummings’ mother was murdered. The killer never caught. Ellie’s best friend Sarah is no longer speaking to Ellie as Ellie ratted out Sarah’s boyfriend. Ellie is now very alone, despite a kind-hearted father who dotes on her. Enter Gabe de la Cruz, the student picked on by Sarah’s boyfriend, and who has apparently had a crush on Ellie for some time. Gabe happens to be a bit of an expert on the Inca civilization … a topic that Ellie needs to do a report on. Gabe helps Ellie out in her homework, but has a special Incan device he shares with Ellie. The device allows Ellie to to visit her dead mother in a different plane of reality. From her dead mother, Ellie learns some secrets that maybe would have been best left secret. Then a race is on to uncover Ellie’s mother’s murderer before Ellie becomes the next victim. The writing is crisp and easy, and Mickelson builds on her plot masterfully, keeping the reader interested. All is not well, however. I do have a couple of small complaints about the book. First, there is the title. The Huaca. Really? I would think that the publisher would have to do a pretty vigorous ad campaign to sell this book to its intended target…teenage girls. There is nothing in this title (or the currently available cover art) to suggest it is a book of tragedy, mystery and romance. And while the huaca does play a role in the book, one could just as easily call this book Lasagna for the role the pasta dish plays. Secondly, there are subplots mentioned, or touched upon, that don’t play much role in the book, other than as a springboard for action, but which leave us with un-answered questions. Still, it is a YA book, and once the teenage protagonist has moved on and forgotten about the events of the sub-plot, it is no longer important for us, the reader, to think about the events as well. I enjoyed this YA book much much more than I was expecting, and certainly more than most other YA books I’ve read, including some that have won literary prizes. Don’t be fooled by the title…this book will definitely keep you reading. Looking for a good book? This is very good Young Adult. But if you’ve watched any television, particularly in its formative years, you’ve not only encountered the work of Frank Peppiatt, but you’ve undoubtedly ENJOYED the work of Frank Peppiatt. I have to admit that I have a soft spot for reading books about the entertainment industry. I like going behind the scenes and seeing how the creative process works. And let’s face it… you can’t do much better than being there when the creative moments first appear from the writer’s mind! Here we learn about the beginnings of Hee Haw (and, probably even more interesting, how it survived being cut by the network — something I actually have wondered about). We dally with Doris Day. We play with Judy Garland and Mickey Rooney. We are there when Rich Little makes his first television appearance. We go backstage with Perry Como, Andy Williams, and even ol’ blue eyes, Frank Sinatra (and yes, Frank could read music!). You could fill a phone book with the names of stars that Frank Peppiatt worked with. His was an era when big name movie stars were giving the likes of television a try. Peppiatt’s writing style is light, smooth and eminantly readable. It makes sense, of course — he spent a long, distinguished career writing bits … moments to fill between commercials that had to be entertaining enough to capture and audience’s attention. But while this style is his gretest strength, it is also a flaw. What works for a television audience doesn’t always work for a book reading audience. There were many times that I wanted more information… more than a snippet of a story that seemed to be included more to drop a name or to set up a punchline than to actually tell us a story. For this, I felt cheated. I wanted the full story, not just the joke. Fortunately, he does spend more than a little time telling about his family life and how his drive and work ethic often prevented him from living a happy family life. This COULD have been written in a single chapter, but he does let us know where he was in his personal life with each important television moment. It is a memoir after all, not a Hollywood expose. One of the most curious moments about the book is the opening chapter. This memoir starts out with a story of Peppiatt and his partner meeting with Jackie Gleason who falls asleep three or four times in their brief pitch meeting, and everyone arond sits and waits quietly for Gleason to wake up. It’s an interesting moment, and certainly it’s an odd moment. Odd not only for the occurence, but an odd way to start out the book. I was expecting it to lead in to the memoir in some strange way, but it really didn’t. It was just a slice of Peppiatt’s life. It wasn’t the start to his career, it wasn’t the ending of his career. It was just a moment between his commercials. And such an odd moment. I almost didn’t read any further. Fortunately, the rest of the book is quite linear and much easier to follow. If he didn’t refer to the moment later in the book (when he had another meeting with Gleason), I would encourage the reader to skip the chapter and read it at the end instead. All in all, a mostly interesting memoir of a man who created many many great television moments. A man whose name I now know and won’t forget. Looking for a good book? Look for this one. Mood. That’s what this book does well — it creates a mood that is enticing, exciting, and entrancing. As readers, we want to keep reading, not so much to find out what the characters are doing, but because we are ‘rêveurs,’ circus groupies who enjoy spending our nights exploring the tents. For this, novice novelist Erin Morgenstern is somewhat brilliant. The atmosphere here is unlike anything I’ve read. Darker and more mysterious than Harry Potter. Sexier than The Magician. But we have to be thankful for this mood, because without it, the book is empty. 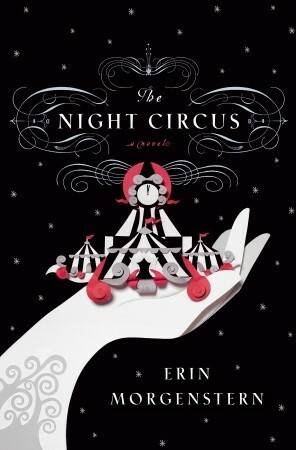 There is a very nice twist to the story (no spoilers here), but of course it involves the circus directly. The basic plot involves a pair of magic-touched lovers who are pitted against one another by their guardians, ancient magicians who play some cruel game against one another using real people. The set-up is fun, but the game gets boring and the characters, at best, two dimensional. Still…there is the circus, and anytime Morgenstern brings us back with all that is magical, we’re sucked in and settling down among the sawdust, waiting for daylight. In case you can’t tell, I liked the circus. I liked the characters that inhabited the circus. I even liked Celia and Marco, our love interest — at least I liked them when they were macigians, planning and practicing for their competition. I liked them much less when they were Romeo and Juliet clones, defying their destinies and families to come together. The mood was the great. The atmoshpere. But when all is read and done, I’m not left with anything remarkable. I’m not hanging on to the story, and I’m not wishing or waiting for the inevitable sequel. It was a fun read at the time because I enjoyed the magic of the book. Looking for a good book? This one just might work for you. Writing a review of this book is more challenging than most reviews I’ve written. Basically, I liked the book, but I really wanted it to be much better than it was. Let’s start with the title: Katya’s World. this book isn’t so much about Katya’s world as it is about Katya herself. And then again…it is about the world and the part Katya plays in it. Hmmm…I see the first problem…what IS this book about…? I’ll admit, the title is the first thing that attracted me to this book, but then, I have a niece by the name of Katja, so it’s not a big surprise that I was drawn to this. I was also drawn to this because it is a YA novel, which I often enjoy reading, and for its SciFi/Fantasy nature…a genre that I typically enjoy. It helped, too, that the publisher was having an e-book sale which I wanted to support (so, yes, I read the ebook version). So let’s get to the story…a girl, born on a planet that was colonized despite terrible odds and after much struggle, has just come of age to pilot a vessel (a water vessel, as most of this planet is under water). On her maiden voyage, the ship is commandeered by a government official transporting a famous war criminal. Ship attack. Destruction. Loss. Thrust in to the middle of a cold war about to errupt. Katya grows up in the heat of battle. What works here is that Katya is a rather unique character. There is no stereotypical love interest, which is a nice change of pace for this sort of story. There is also some very nice world-building and just the right amount of history tossed in which makes it all very credible. It’s easy to believe that Katya is above average and a little better than most … if she weren’t we wouldn’t be reading her story … but she still comes across as being a little too good to be true. She takes fantastic leaps in logic or physical prowess that don’t seem appropriate for someone her age. While the world-building is well done, the details on the more intimate spaces are lacking. It’s difficult to differentiate one place from another. All places seem the same — from the inside of Katya’s sub, to the inside of the Leviathan, to the inside of the station. Sometimes I had to go back and look to see where we were now because they were all so similar. 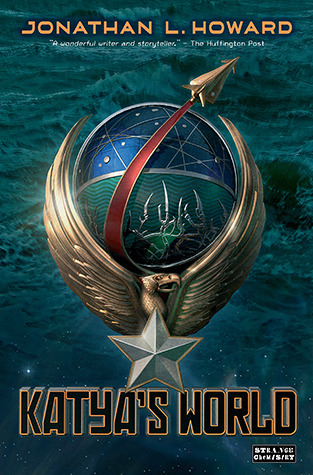 Part of this comes with the challenge that Jonathan L Howard set up for himself by setting his world under water. It is nice that, while part of a planned series, this book does have it’s own beginning, middle, and end, and if I never read another “Russalka Chronicles” book, I don’t feel cheated. However, I liked it enough, and was intrigued enough, that I would probably buy the next book in the series. Looking for a good book? This would count as such. I’ve said it before and I’ll say it again…Bruce Coville is one of the finest writers writing sci-fi, fantasy, YA, mystery, horror, humor today! If you think you know Coville’s work based on some of his humorous kids’ books (“My Teacher Was an Alien” and the like), then you don’t really know Coville. This collection, the third of his “Odd” collection of short stories easily stands alongside my other favorite sci-fi authors: Harlan Ellison, John Varley, Kim Stanley Robinson, Roger Zelazny. And I rarely feel like I’m reading a ‘kids” story. Not a single story in this collection disappointed, and each story was as different from the next as possible, displaying Coville’s versatility as a writer. If you want to be moved, nearly to tears, read “The Boy with the Silver Eyes” (and if you’ve read his fantastic “unicorn” series, you’ll be mighty pleased with this additional story). If you want to be a little terrified (but know that you’ll come out okay on the other end), then “The Mask of Eamonn Tiyado” will satisfy (and again…fans of a Coville ‘series’ — the Magic Shop Books — will be mighty pleased here). I just can’t recommend Coville enough. Pick up a book, start to read, and you won’t be disappointed. I like to read. You do, too, or you probably wouldn’t be here. I also like to write. So…why not write about books? Lots of people do it. Do we really need one more person writing about books? Well…”need”…? Probably not. What makes me so special that you should look at my reviews? I have a unique voice and a unique take on the books I read. Okay…the truth is…EVERY writer/reviewer has a unique voice. Maybe you’ll like what I have to say and/or the way I say it. Maybe you won’t. But you won’t know for sure unless you read a few reviews. Go ahead, give it a shot. It’ll take, what, ten minutes of your internet surfing time?